Weak nails has been with me since like forever. I could never have long nails as it tends to tear because its too soft. What a pain. But worry not! I've found the thin to help us ladies with weak and soft nails! At first I never thought anything would happen to my nails, I just use it because my sister has it. *And yes the one in the picture is my sister's. Ahem. * But boy, I was wrong. I never realize it has strengthen my nails until I forgot to trim 'em off. I like it clean and short, just a little bit over growth. They were so long but still so sturdy. Usualy when I get my nails that long it bends all over when I do anything using my hands. 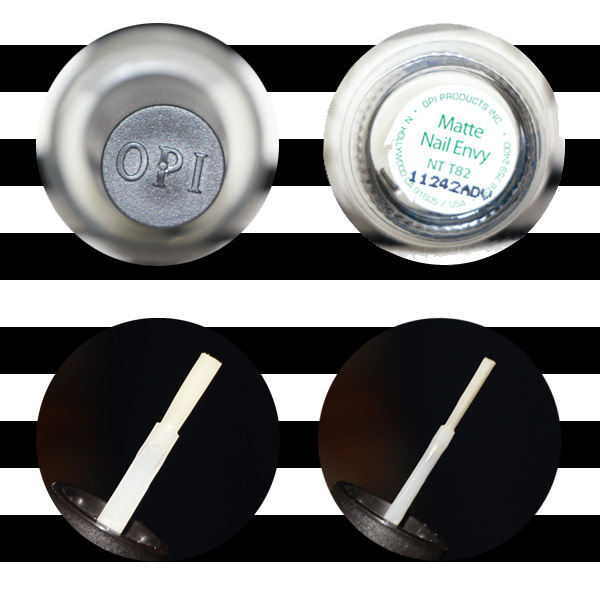 It has the regular OPI applicator which I love. They're wide and tappered, making it easier to paint my nails. Use it before you paint your nail with colors. It act as a base coat and a nail care. Double duty alert! And as a base coat it really helps my nail polish to goes on smoother and last a lot longer. As you can see, both has one coat of white nail polish and the one with OPI as the base coat is spread more evenly and make it more opaque, while the one without is blotchy and strikey. With this my nail polish can last up to 5-6 days without chipping. Except when I open a drink can or some stuff that requires my nails to get involved. OPI Nail Envy available in so many choices that you can choose to heal your nails from any of its problems.